I began HPN 27 years ago and was advised not to own pets. Doctors said, “They carry too many germs. They’re a lot of work. It’s risky business.” HPN was a new therapy then; doctors had reason for concern. My HPN training was excellent and I practice it everyday. I’ve also owned dogs all my life and have never had problems associated with them. Presently I have Zoë, a black lab, and Doodle, a Jack Russell terrier (JRT). They give me a workout yet it doesn’t feel like work. Zoë weighs 90 pounds and thinks she’s a lap dog. Doodle weighs 25 pounds and has confidence the size of an elephant, yet he believes he can be a mouse and live in my pocket. They’re true friends. Our relationship is one of equal respect and love for each other. Pet owners know the benefits outweigh the risks. The CDC, the National Institutes of Health, and the U.S. Dept. of Health and Human Services all agree that pet ownership can provide benefits, and they have several documents to support the argument. Organizations such as the American Kennel Club, American Veterinarian Medical Association, shelters, hospitals, nursing homes, police and fire departments, and the armed services all report the same: Pets benefit health! Pets drive us to exercise them, and feed and water them. Some days, it may feel like work, but most days it’s a job we do gladly. Care giving is rewarding in so many ways. y’s research and medical director, Lyn Howard, MD, enjoys chickens, cats, dogs, horses, and more. They give her, her family, and her friends great pleasure. 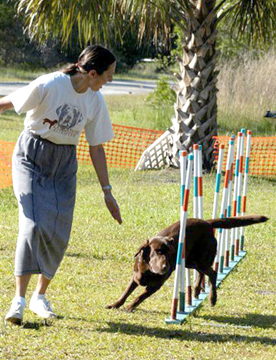 Consumer and Oley Regional Coordinator (RC) Barb Klingler says, “Pets have been a huge part of my life.” Her chocolate lab, Sara, can do 25 tricks and has garnered over 11 AKC titles in dog agility. Barb has raised three guide dogs for the blind, all the while running with Sara. Now Barb’s new puppy, Abby, has begun training and Sara can enjoy retirement. “Agility builds my bones and theirs,” Barb comments. When her energy level is low, her dogs inspire her to get involved with people. “Being on TPN doesn’t end things we enjoy,” Barb adds. “My dogs are great cuddlers and companions.” If you’d like to learn more about the fun, challenging activities Barb’s involved in, watch the Animal Planet channel, or contact the AKC or Dogs for the Blind. The Cyr family of Sebattus, Maine, got Tickles, a JRT puppy, for their 13-year-old daughter Maisy. She’s been an HPN consumer for 11 years. Maisy loves animals. She recently spent time volunteering on a pony farm, where children learn to ride and conquer fears. Oley RC Judy Peterson is passionate about her pals, and her e-mail address reflects that (it’s “catsjp”). Judy has had health problems but knows her cats support her. They cuddle, snuggle, and purr. They sense if she isn’t feeling her best, and they’re there to give her unconditional love. “Being loved by my cats is one of the best kinds of love in the world,” she says. Consumer Charleen Rouleau of Alberta, Canada, writes, “My pet has a huge impact on my life.” Charleen owns a 15-year-old Pomeranian. Her dog is number one in her book. Charleen says, “Owning a pet is like having a child around.” It’s an experience she feels blessed to have. Of all of the people I interviewed, I only met two people who have had problems with pets, and they were small and easily remedied. One woman woke to find her kitten chewing on tubing; the kitty didn’t breach the sterility of the line, though. She changed the tubing (just to make sure all was sterile again) and resumed infusion; then she gave her kitty an alternate toy to play with. Distraction is a wonderful tool to use when you own pets. Another person tripped over his line while avoiding a pet. (This happens to me all the time.) Though he did not fall, it could have been a big problem. Now he loops his tubing much like an electrical cord and stuffs it in his pocket. That way nothing is loose and flying free. I too use this technique. No pockets? No problem. When moving about the house, I carry a cane or fly swatter and hold it in front of me, or to one side; this makes my “space” larger and the dogs won’t come near me, therefore yielding to my movements. Nudging them with my leg or arms also lets them know where the invisible line is. Most animals gladly yield with voice or body commands. Once I’m hooked up with HPN in a chair or bed, then they’re allowed to enter my space—when the tubing is tucked away and secure. Many consumers pin their tubing to their clothes. Try wrapping a piece of tape around the tubing about 8-12” away from the body; have the ends of the tape overlap about 1” to create a tab. Then take a safety or diaper pin and pin it through the tab, then through the clothing, and close the pin. In the event the tubing gets pulled by a pet, or caught on a doorknob or other protrusion, the pressure is put on the pin not the tubing. The tugging will warn you before a big problem occurs. If you’re considering owning a pet, do your research first. You can go online and find many sites with information. Choose a pet that fits your lifestyle. If you’re unable to own a pet, there are volunteer opportunities that will allow you to be near pets; ask at your local shelters, kennels, animal farms, zoos, and wildlife rehab facilities. Pets are wonderful companions. They help us live longer, happier lives. They give us the will to live, and they’re always ready to give unconditional love.